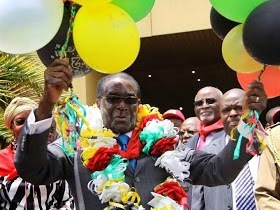 Zimbabwean president, Robert Mugabe will turn 91 years old on February 21st and the country's ruling party, Zanu PF is planning to host a $1million birthday jamboree to celebrate him just as they did last year when he turned 90. According to an official of the ruling party, Tongai Kasukuwere who spoke with Zimbabwean media, the party had raised 60% of the total money needed for the birthday jamboree which is expected to be hosted at the luxirious resort town of Victoria Falls. "We have sourced more than half of what we want and more companies and individuals are promising to contribute in the near future. We are looking at a sizeable figure which is befitting the magnitude of the person whose birthday we are celebrating. To us as Zanu PF youths, this is a moment to celebrate his achievements and greatness and celebrate what he has done for Africa and the world as a whole." he was quoted as saying. President Mugabe came into power after Zimbabwe's independence in 1980. Na wa o. See balling wen peoplefor the country deey suffer.